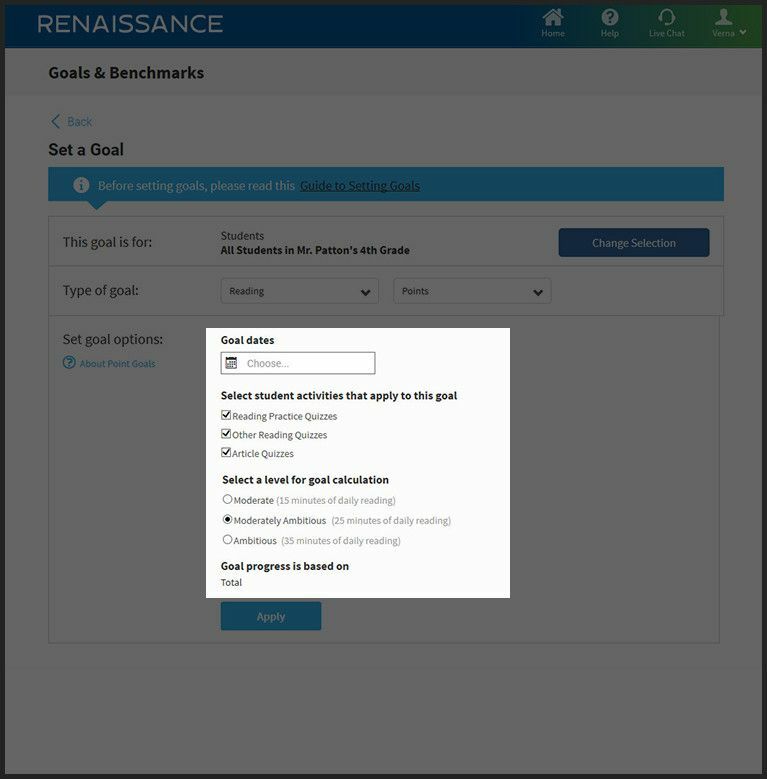 Renaissance Accelerated Reader products equip teachers with unparalleled insight into independent reading practice, research-proven goal setting tools, activities that span a variety of skills and text types, and a worldwide community of support. Students enjoy endless choice and the agency required to truly fall in love with reading, achieve mastery, and grow. 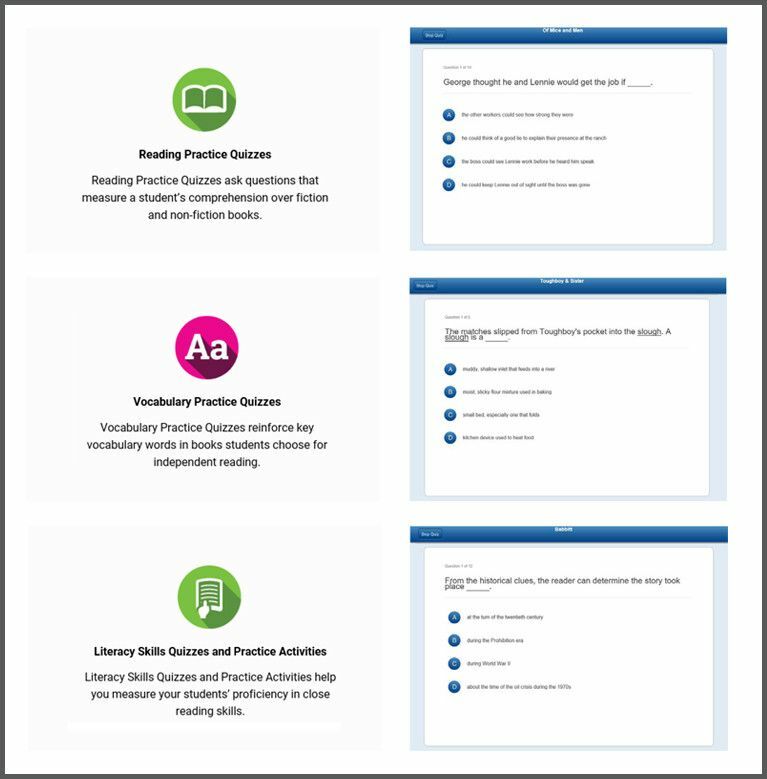 Renaissance Accelerated Reader products equips teachers with unparalleled insight into independent reading practice, research-proven goal setting tools, activities that span a variety of skills and text types, and a worldwide community of support. Students enjoy endless choice and the agency required to truly fall in love with reading, achieve mastery, and grow. independent evaluations, and studies show proven results. Students nearly 2x as likely to be college & career ready. The importance of reading practice in preparing students for college and career success is widely recognized. But not all reading practice is created equal. Research shows effective practice requires deep engagement, active ownership of learning, and the right level of challenge. Accelerated Reader and Accelerated Reader 360 take over the heavy lifting in supporting this “perfect practice” for teachers, giving them valuable time back to do what they do best — connecting with students and creating phenomenal learning experiences in the classroom. 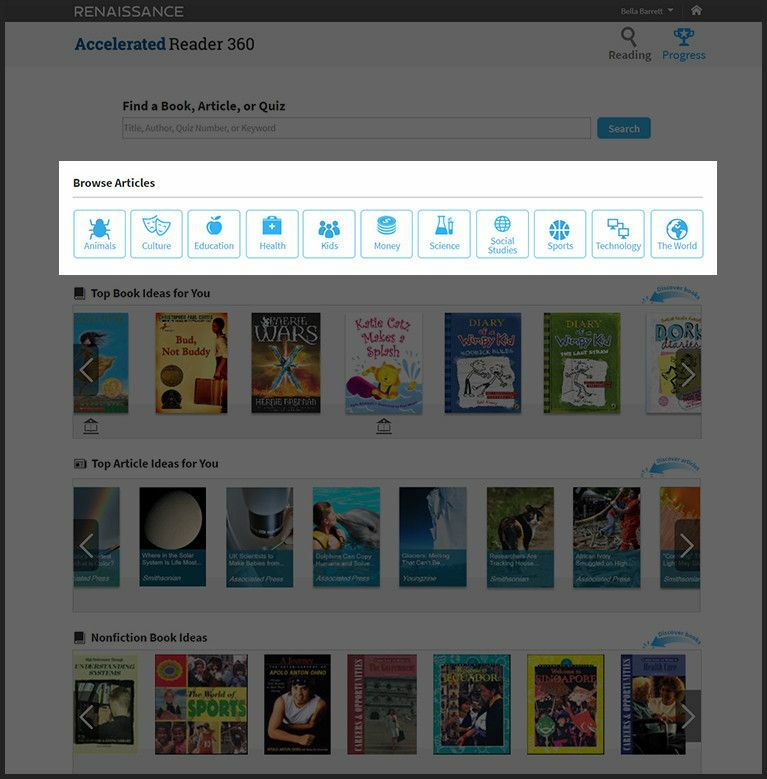 Accelerated Reader products help you set the right goals, match kids with the right reading materials, and gain deeper insight into progress quickly and efficiently—giving you more time back to differentiate and personalize each child’s learning experience for a profound and proven impact on growth. from their teacher and self-monitoring of progress towards goals. 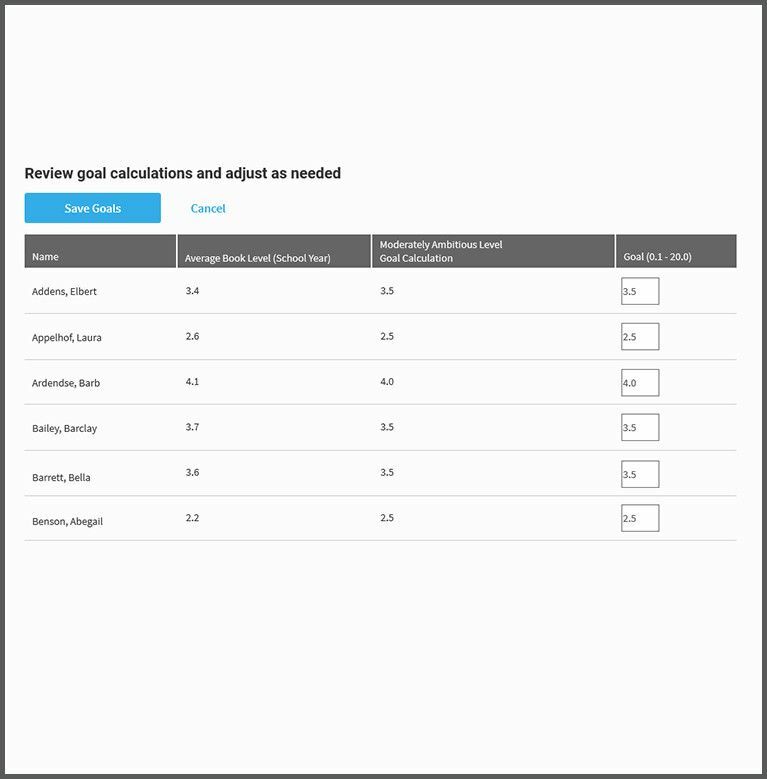 Set goals, monitor progress, and provide feedback on reading and skills practice. Nearly 200,000 quizzes and skills practice activities* ensure students will never run out of choices. Plus, they’ll see personalized suggestions based on their own reading history. The main event: based on personalized goals, hone close reading skills in built-in nonfiction articles*. Book and article quizzes help practice independent reading comprehension. Robust analytics and reporting give you instant insight into progress toward reading goals and mastery. Quickly identify who needs more support and adjust students’ individual paths toward growth. Accelerated Reader products help you set the right goals, match kids with the right reading materials, and gain deeper insight into progress quickly and efficiently - giving you more time back to differentiate and personalize each child’s learning experience for a profound and proven impact on growth. GUIDE: Maximize independent reading time by setting the right goals. 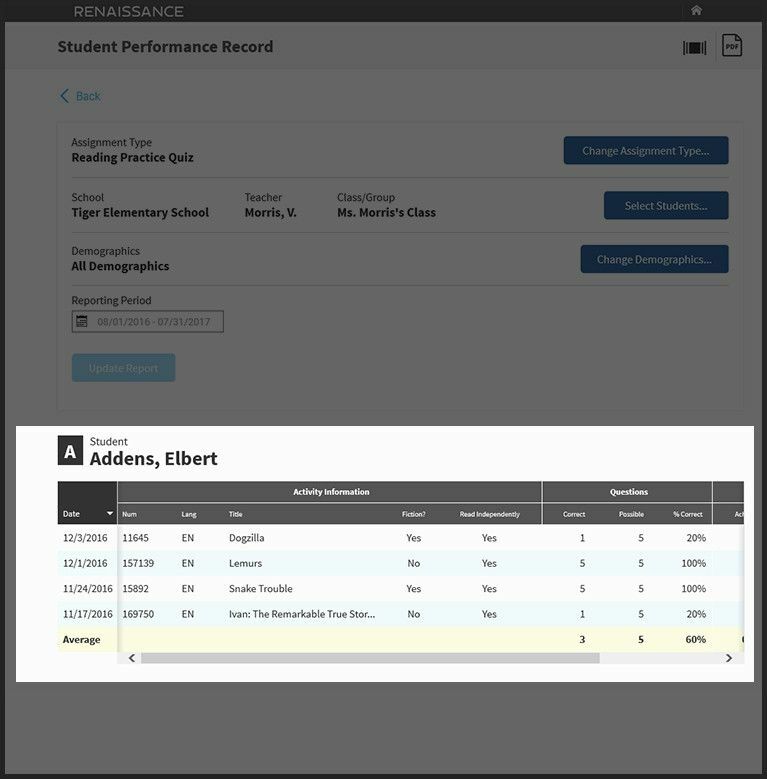 Your Star Assessment® data flow seamlessly into Accelerated Reader products to automatically create goals at a student’s “just-right” reading level and to personalize reading recommendations. Set goals for ALL students’ reading practice – books and articles*. Engage: Motivate every student with “just-right” recommendations and endless choice. 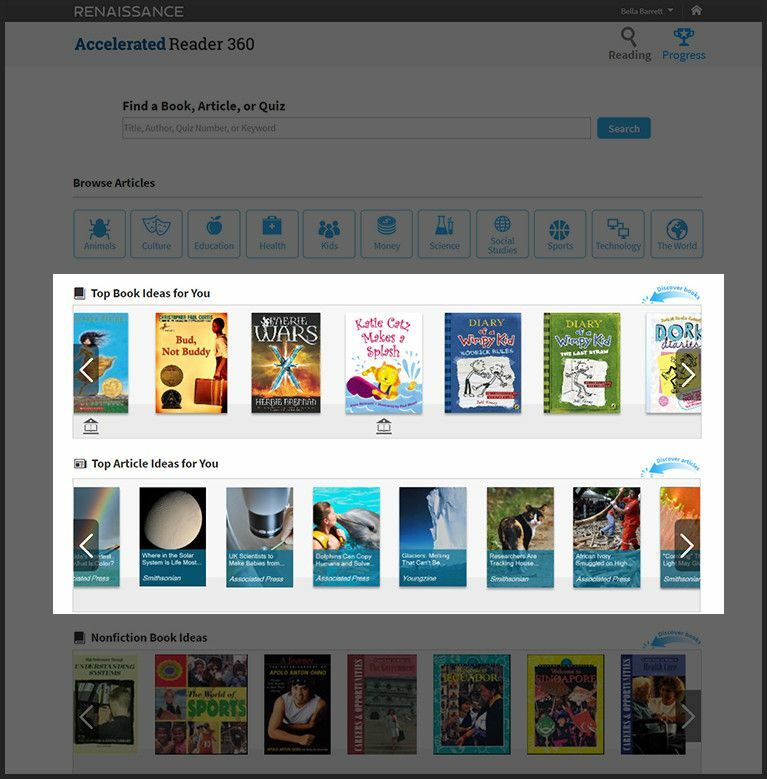 Accelerated Reader and Accelerated Reader 360 make it easy to build motivation, engagement, and a love of reading through matching students with books and articles* (nearly 200,000 of them!) aligned to their interests and at the right level of challenge – and by offering extensive choice in what to read next. Students see book and article* suggestions targeted precisely to their reading level. As they read and take quizzes, recommendations become more refined based on their interests. Engage: Boost nonfiction literacy and close reading skills. Built-in nonfiction articles from great partners keep students engaged as they practice close-reading skills activities like highlighting and tagging. Students can self-discover articles, or teachers can quickly find and assign content based on subject, level, skills, and much more. Students self-discover nearly 2000 built-in digital nonfiction articles aimed at their reading level and interests. Each nonfiction article includes a set of instructions, at least one highlight and tag activity, and a comprehension quiz. Different articles focus on different skills. Practice: Build skills beyond reading comprehension. Activities in Accelerated Reader and Accelerated Reader 360 go beyond how assessing how well students understand what they read – building the vocabulary and literacy skills that play a fundamental role in the reading process and contribute greatly to comprehension. Many titles offer Vocabulary Practice and Literacy Skills quizzes, in addition to the standard Reading comprehension quiz. Grow: Gain actionable insights to accelerate student growth. 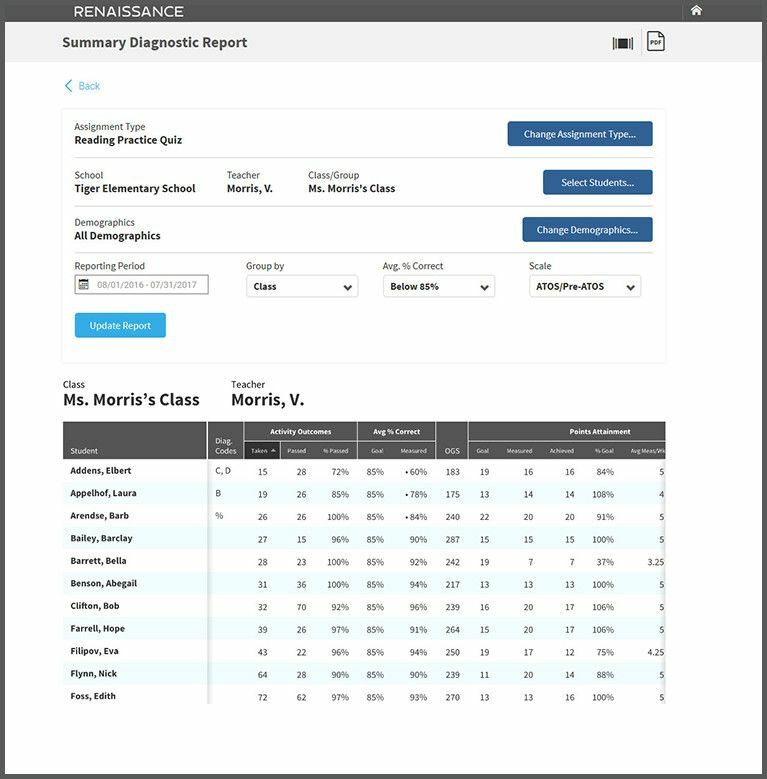 A complete menu of powerful reports provides quick and efficient insight into every child’s progress, freeing teachers to spend more time with each student in better differentiating and personalizing the learning experience. 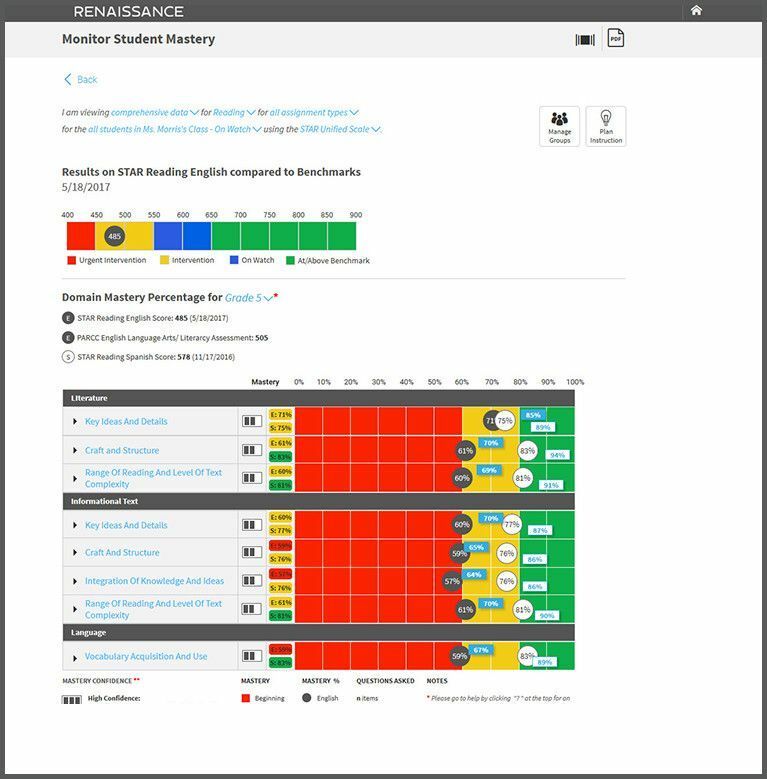 If using Renaissance Star, assessment data provides highly personalized book level guidance – books and articles visible on their own unique Discovery Shelf provide students choices that fall precisely within their Zone of Proximal Development (ZPD) range. It’s a continuous circle - if kids are motivated to read, they spend more time reading, become more engaged in reading and are motivated to read more. Motivation is critical, and it all starts with choice. Print or digital, from the school library or anywhere else, the latest bestseller or a perennial classic, with nearly 200,000 quizzes in the Accelerated Reader 360 database, choice is nearly limitless! New standards place more emphasis on reading nonfiction, and it’s an essential skill for college and career readiness. Tap into students’ interests by connecting fiction to nonfiction and help them discover that the real world can be just as engaging as make-believe. Teachers can search for and assign specific articles to students – even bring in their own content! Teachers can also specifically find and assign articles covering particular skills. 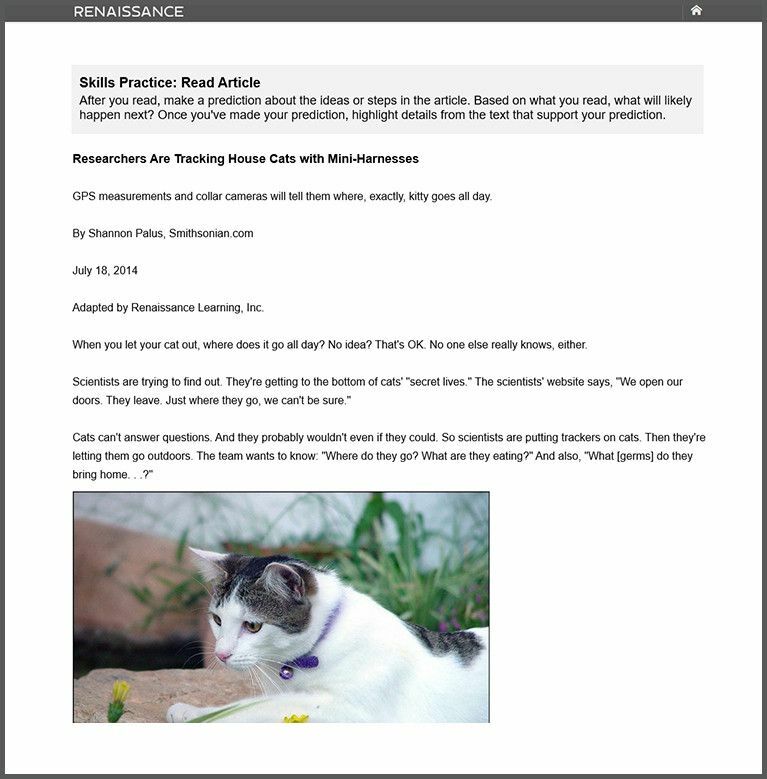 Students can self-discover article reading and skills practice on their own . The impact of reading practice goes beyond only how well students understand what they read. Vocabulary building and acquisition of literacy skills both play a fundamental role in the reading process. 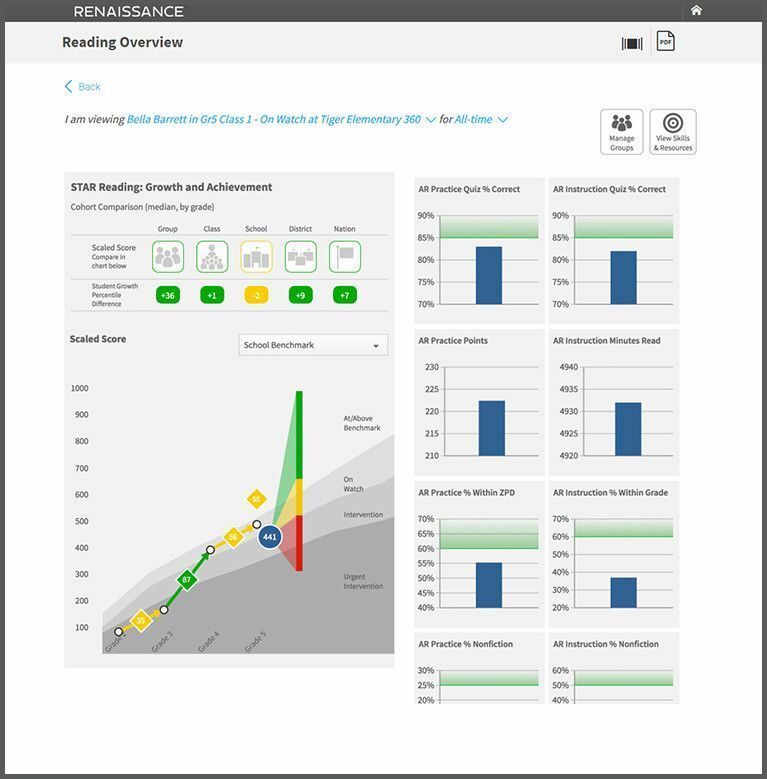 Your Star Assessment® data flow seamlessly into Accelerated Reader 360 to automatically create goals at a student’s “just-right” reading level and to personalize reading recommendations. Accelerated Reader and Accelerated Reader 360 are some of the most heavily researched programs in the world, with one of the largest databases of K–12 learning analytics. This invaluable insight tells us what makes practice effective and what doesn't, so teachers can confidently focus on exactly what accelerates growth. Educators share their Accelerated Reader success stories. Ready to maximize time spent practicing and jumpstart growth? Let’s talk about introducing Accelerated Reader products into your classroom.